New York City Ballet Director of Costumes Marc Happel and Draper Kellie Sheehan conduct a costume fitting with soloist Indiana Woodward for Justin Peck's Pulcinella Variations, with costumes designed by Tsumori Chisato. Tsumori Chisato designed the costumes for Justin Peck's new ballet Pulcinella Variations. The New York City Ballet's costume shop is located on the eighth floor of a building in Lincoln Center. There are spectacular views of the Hudson River, but no one's looking out the windows. They're all working with a quiet intensity. "It's a shop full of 18 people," says Marc Happel, the City Ballet's director of costumes. "Amazing craftspeople, machine operators, hand stitching, we have three drapers. I mean the level of costume-making here is probably the highest you could get." In addition to preparing costumes for the regular season, next week the City Ballet will present its annual Fall Gala, where fashion designers are paired with choreographers to create new dances and new costumes. That means the costume shop has less than three months to build garments designed by people who don't usually worry about athletic, sweaty dancers. That's where Happel provides invaluable assistance. He's run the shop for 11 years, and before that worked on Broadway and at the Metropolitan Opera. "Many times the fabrics that [the designers] do come up with we often use in ballet, like chiffon or organza or crepe du chine," he says. "But what we have at our disposal is companies that make stretch chiffon and stretch crepe du chine. So that's to our advantage." Actress Sarah Jessica Parker is on the board of the City Ballet and came up with the idea of the annual Fall Gala six years ago. She sees Happel and the costume shop as invaluable partners. "Marc knows the reality of everything," Parker says. "He can solve the inevitable technical questions that come up. Because, yes, they know all the layers that are required. They know how every fabric moves, they know what a seam does, what a hem does, what stretches, what doesn't, what absorbs, what doesn't, what can be lifted, what can move." And the designers value working with Marc Happel, too. The first gala featured designs by Italian couturier Valentino, and Happel says he was very hands on. "To the point where he would call me when he was on vacation on his what he called a boat — which I knew was a six-story yacht — in the Mediterranean," Happel says. "He would call me because he had just had a thought that the black ruffle on this one costume should be pleated and not ruched." But the ultimate client is the dancer. "My job is to make them as comfortable and as happy with what they're wearing, so they're not really thinking about it too much," he says. While a rehearsal of Swan Lake is happening onstage, backstage Happel and one of his drapers are fitting a costume by designer Tsumori Chisato on ballerina Sterling Hyltin. The fabric is hand-painted and the tutu looks like a hat box. While choreographer Justin Peck looks on, Hyltin does movements from the ballet, looking in the mirror the whole time. Afterwards, she says the costume is incredible. "I mean I wear a tutu a lot, but not a tutu that's that structured and geometric," Hyltin says. "And I think it's going to be a lot of fun just sort of learning how it moves and see how that influences the way I dance." Both the dances and the costumes will live beyond the Fashion Gala, as part of New York City Ballet's repertory. But Happel doesn't have time to worry about it. There's just too much work to do. "I always say it's like you have four freight trains heading to the station at the same time and you're just hoping in some ways that they all get there at the same time," he says. "And we have a gala." Next week, New York City Ballet will present its sixth annual fall fashion gala, where fashion designers are paired with choreographers to create new dances and new costumes - and perhaps one for BJ Leiderman, who writes our theme music. You wouldn't think this is a promising story for radio. 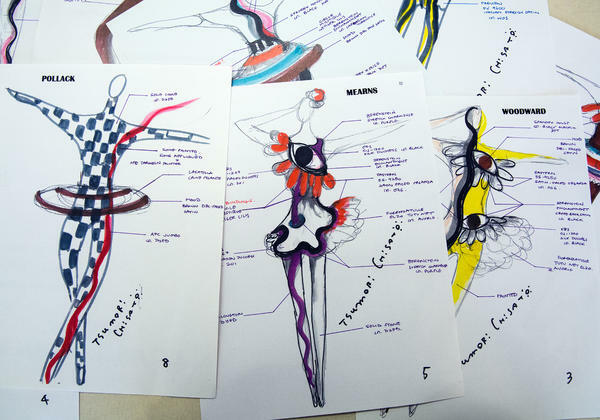 But Jeff Lunden visited the City Ballet's costume shop to discover how designs on a page become costumes onstage. JEFF LUNDEN, BYLINE: City Ballet's costume shop is located on the eighth floor of a building in Lincoln Center. There are spectacular views of the Hudson River, but no one's looking out the windows. They're all working with a quiet intensity. Marc Happel is director of costumes for the City Ballet. MARC HAPPEL: It's a shop full of 18 people - amazing craftspeople, machine operators, hand stitching, we have three drapers. The level of costume making here is probably the highest you could get. LUNDEN: Happel has run the shop for 11 years but, before that, worked on Broadway and at the Metropolitan Opera. In addition to preparing costumes for the regular season, the costume shop has less than three months to build garments designed by people who don't usually worry about athletic, sweaty dancers. That's where Happel provides invaluable assistance. HAPPEL: Many times, the fabrics that they do come up with we often use in ballet, like chiffon or organza or crepe de Chine. But what we have at our disposal is companies that make stretch chiffon and stretch crepe de Chine. So that's to our advantage. SARAH JESSICA PARKER: Marc knows the reality of everything. LUNDEN: Actress Sarah Jessica Parker is on the board of the City Ballet and came up with the idea of the fall fashion gala six years ago. She sees Happel and the costume shop as invaluable partners. PARKER: He can solve the inevitable technical questions that come up. Because yes, they know all the layers that are required. They know how every fabric moves. They know what a seam does, what a hem does, what stretches, what doesn't, what absorbs, what doesn't, what can be lifted, what can move. LUNDEN: And the designers value working with Marc Happel, too. The first gala featured designs by Valentino. And Happel says the Italian couturier was very hands on. HAPPEL: To the point where he would call me when he was on vacation on his what he called a boat, which I knew was a six-story yacht in the Mediterranean. He would call me because he had just had a thought that the black ruffle on this one costume should be pleated and not ruched. LUNDEN: But the ultimate client is the dancer. HAPPEL: My job is to make them as comfortable and as happy with what they're wearing so they're not really thinking about it too much. UNIDENTIFIED WOMAN: You think there's a way this could snap? LUNDEN: While a rehearsal of "Swan Lake" is happening onstage, backstage Happel and one of his drapers are fitting a costume by designer Tsumori Chisato on ballerina Sterling Hyltin. The fabric is hand-painted, and the tutu looks like a hatbox. While choreographer Justin Peck looks on, Hyltin does movements from the ballet, looking in the mirror the whole time. Afterwards, she says the costume is incredible. STERLING HYLTIN: I mean, I wear a tutu a lot but not a tutu that's that structured and geometric. And I think that it's going to be a lot of fun to sort of - learning how it moves and seeing how that influences the way I dance. LUNDEN: The dances and costumes will live beyond the fashion gala as part of New York City Ballet's repertory. But Marc Happel doesn't have time to worry about it. There's just too much work to do. HAPPEL: I always say it's like you have four freight trains heading to the station at the same time, and you're just hoping in some ways that they all get there at the same time and we have a gala. LUNDEN: Trains are set to arrive at 7 p.m. on Thursday. For NPR News, I'm Jeff Lunden in New York. Transcript provided by NPR, Copyright NPR.